The short answer is probably. But let’s catch up and make sure we’re on the same page. So you’ve built your growth marketing team - your dedicated crew of customer acquisition experts. Great! But somewhere along the road, growth slows. The team may have exhausted the new sources of growth they once identified as gold mines. Is there something your team can do to identify new watering holes where customers lay? Maybe your growth team would benefit from a customer acquisition platform. As Neil Patel points out in his blog, “35 Growth Hacking Tools for Marketers Who Don’t Code”, there are a variety of different tools that can help with a number of your growth marketing efforts including: traffic acquisition, lead acquisition, market research - the list goes on. But almost none show you the full range of sources that heard traffic to your website and quantify it actionably - considering outcome first. And practically none of them can analyze your competitor’s actions to tell you what new advertising efforts will work for you and what won’t. Imagine if you had a platform that showed your growth team what specific affiliate sites, display ad locations, and keywords will yield the largest result for you based on analysis of your whole competitive ecosystem. One that showed you exactly what to do to optimize your digital spend - based on insights no one else has. It’s hard to know whether yet another software is worth investing in. Knowing this, we’ve created a list of questions regarding specific insights you might be missing out on - to know if it is indeed time to make a change. 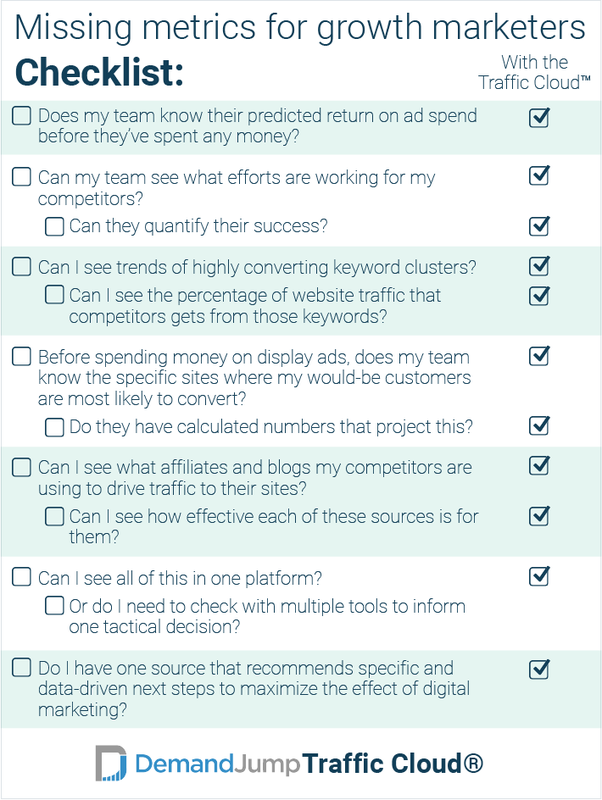 If you answered no to any of these questions and would like to see a solution that changes that, check out the DemandJump Traffic Cloud™. In the meantime, we'd like to help you out with tips to get the most from your paid search efforts. Check out our paid search webinar to learn more.